Miami head coach Al Golden has been connected to the opening at Penn State since Bill O'Brien left for the Houston Texans. The continuing uncertainty surrounding whether University of Miami coach Al Golden will stay in Coral Gables or leave for the opening at Penn State has already affected recruiting. Hialeah Champagnat Catholic defensive tackle Travonte Valentine decommitted on Saturday after the U.S. Army All-American Bowl in San Antonio. Valentine, a four-star player who had been one of Miami’s 29 commits, named LSU his top choice. 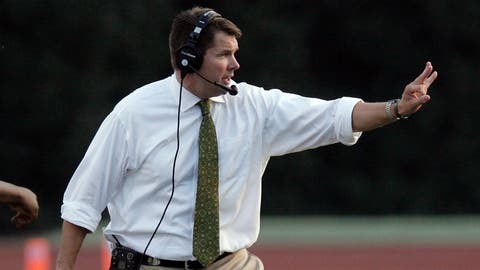 "Since Miami ain’t looking so good now, until further notice, I’m decommitting from Miami University because I’m not sure about Al Golden so far," Valentine said in an interview with The Times-Picayune (New Orleans). 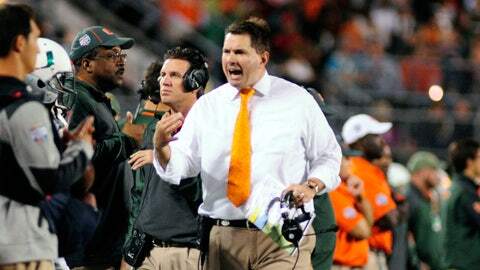 Al Golden is rumored to be on the wish list for Penn State as it searches for a new head coach. "All of the commotion about Penn State and this and that right now. Al Golden is a great coach. He told me I was going to see things that I’ve never seen before. So for right now, I’m decommitting." Earlier this week, Penn State reportedly put Golden on its wish list to replace Bill O’Brien, who took an NFL head-coaching job with the Houston Texans. On Friday, reports stated the Nittany Lions planned to interview Golden over the weekend in South Florida. The Miami Herald heard back from UM athletic director James Blake, who said he has been in regular communication with Golden, on Saturday via text. He wrote: "He is our football coach and I believe he will be our coach going forward. Go Canes!" Golden, 44, was a tight end for Penn State from 1989-1991 and a linebackers coach and recruiting coordinator for one season under Joe Paterno in 2000. In three seasons with Miami, Golden has gone 22-15. He is under contract at UM until Jan. 31, 2020. Neither the University of Miami nor Golden has released an official statement. Monday’s press conference with Golden to wrap the 2013 season is still scheduled as of now.